Spare or replacement reeds for the Ashford Knitters Loom﻿. Reeds are available for differing yarns. The 2.5, 5, 7.5 and 10dpi (10, 20, 30 and 40/10cm) reeds feature the wide eye for novelty yarns. The fine 12.5dpi (50/10cm) and the NEW extra fine 15dpi (60/10) reeds are also available. 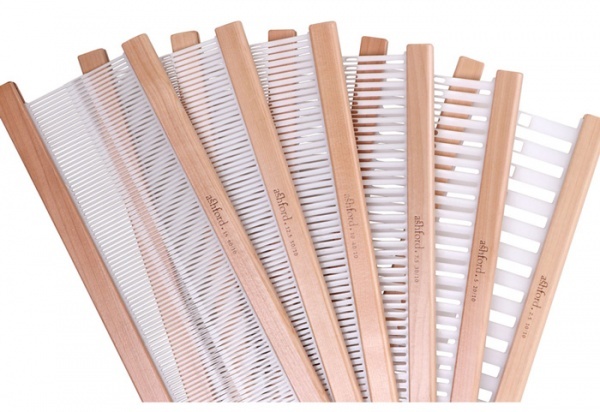 Made from strong, durable nylon with Silver Beech rails. The reeds come in 30cm, 50cm and 70cm (12ins, 20ins and 28ins) widths.